"Individually we can achieve little. Unitied we can accomplish all." Hello from Washington D.C! 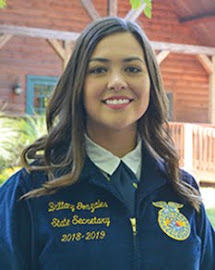 As mentioned in the last blog post, this week Brittany and I flew out to Washington D.C. while the rest of our team began diligently preparing for the great Indiana State Fair. Since being elected as a State Officer, our schedules have been packed and this week has yet to show any signs of slowing down. These past five weeks have felt like five minutes. All bringing, great people, great food, and great friendships. This week has continued to follow the trend. 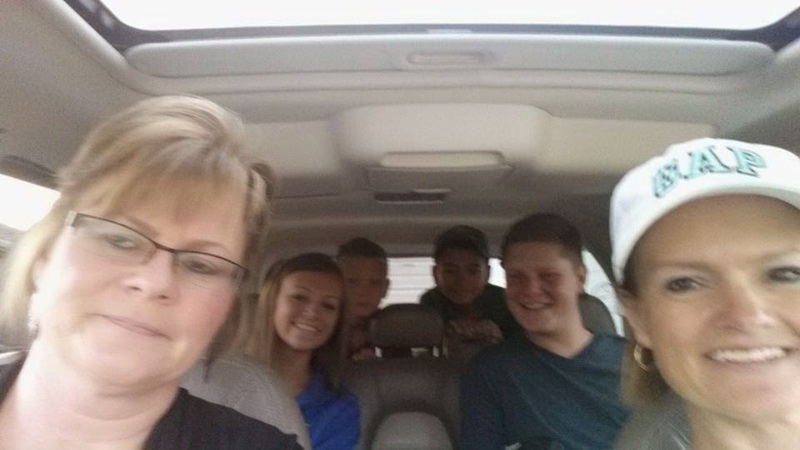 Brittany's family and I piled in the car and were ready for the trip to Louisville. Early Monday morning, I meet up with Brittany at her house so that her mom, aunt, brother, and friend could drive us down to the Louisville Airport. Now if you have never met Brittany's family you definitely should. Hope, Faith, and Love radiates from each of them. After arriving at the airport, my list of "Firsts" began to grow. First time going through airport security, first time flying, first time checking my luggage, and first time meeting the Director of the Secret Service for the Department of Homeland Security. Yea that's right Brittany and I met the Director of the Secret Service. While on the plane, we had the pleasure of meeting a lady who showed an interest in the FFA and helped me enjoy my first flight. It wasn't until seconds before she exited the plane that she gave Brittany and I her business card. This was when we realized who we had just spent the last two hours getting to know. This just proves that you meet the most unexpected people in the most unexpected places. Lets just say that this is a memory that we will never forget. After finally arriving at State Presidents' Conference, we wasted no time getting down to business. Throughout the conference, leadership delegates from 49 states (all but Hawaii) and Puerto Rico and the Virgin Islands, were challenged to Rise Up. 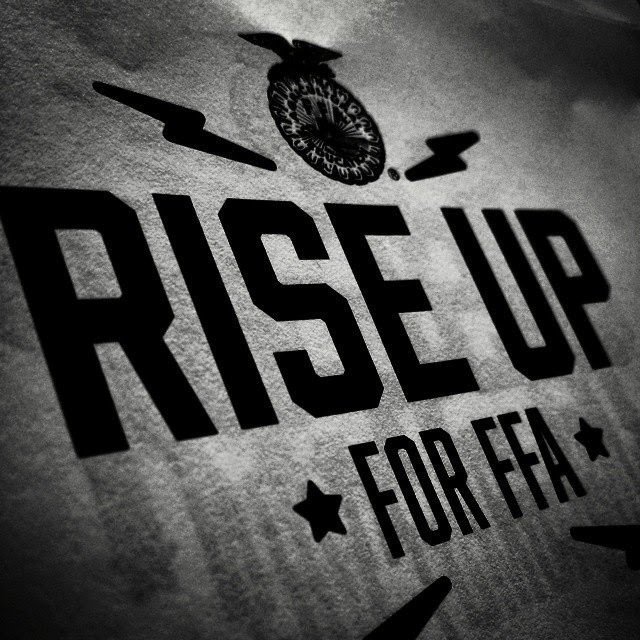 Whether that meant rising up for personal improvement or improvement for FFA and agriculture, each delegate took this challenge with pride. 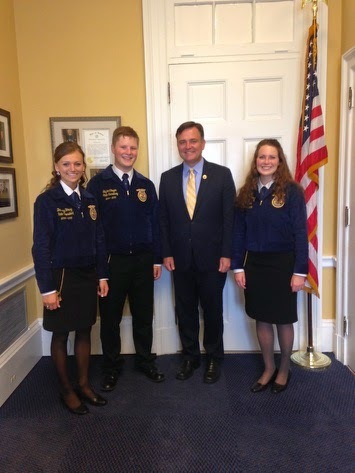 State officers that we met at NLCSO, joined us for a free day in D.C.
Our team decided at NLCSO that we were determined to submit a proposal for the National FFA Organization to establish a National Agricultural Education CDE. After countless hours perfecting this written plan, we were honored that our proposal was chosen as committee business for the National FFA Delegate Committee Process. 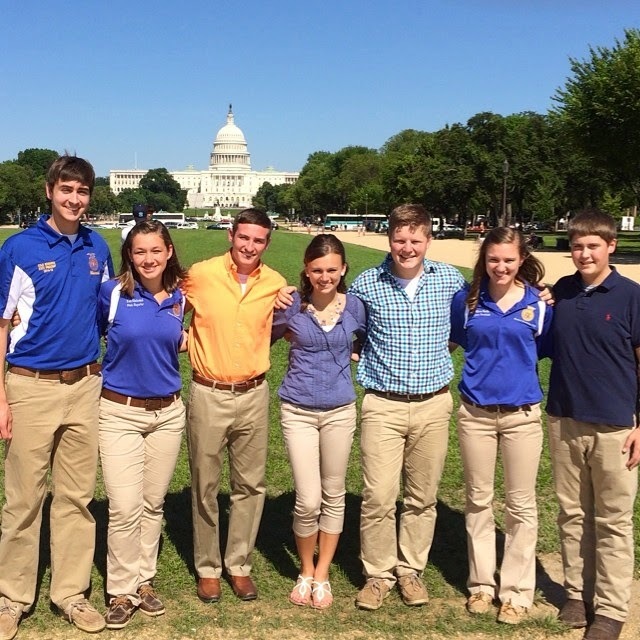 There are six committees that the state officers will be serving on this year at National Convention, and an Ag. Ed. CDE is included in one of those committees. How cool is that?! 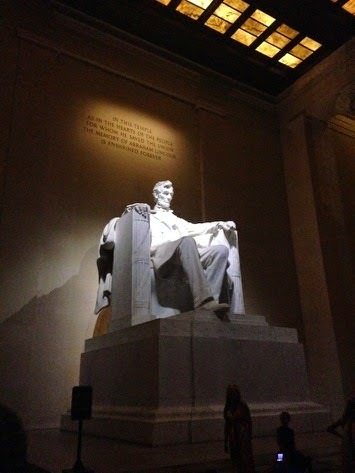 Spending the last week in our nation's capital has been surreal. Standing in the same spot that President Lincoln began his campaign against slavery, being amongst our nation's greatest leaders, and basking in the rich history of Washington D.C. has left a lasting impression on my life. If you have never been to D.C. I encourage you to go. Whether it be for family vacation, Washington Leadership Conference, or even lobbying for agriculture on the National level, D.C. has more to offer than stuffy old men and worn pieces of paper. D.C. is the place where it all began, where we began, and where our future lies. 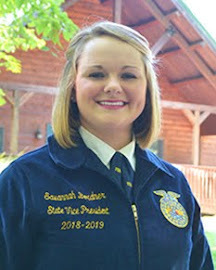 As leadership delegates, it was Brittany and I's duty to represent the over 10,000 members of Indiana FFA and the over 600,000 members of the National FFA Organization. As an individual state, we can do little to change other minds on agriculture, our future, or even our youth, but united we can accomplish all. 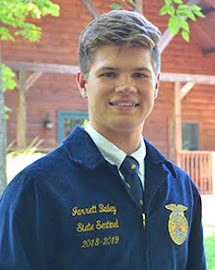 The National FFA Organization, formed during the Great Depression, has faced its trial and tribulations, yet united we have been able to Rise Up these last 87 years and I am confident that the work done by the 101 leadership delegates these past seven days will ensure that FFA will stay relevant and Rise Up for the next 87 years and even after. Individually we can achieve little. United we can accomplish all. Good morning Indiana FFA! Today is a beautiful day! As I sit here in the office, I cannot help but feel blessed to have woken up this morning with the opportunity to make today a great day! Each day is a gift and that is why it is called the present! Let's make every single day count! 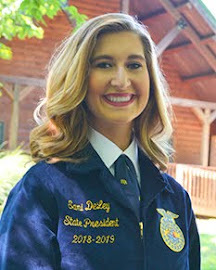 Like the State Northern Region Vice President, Miss Lindsey O'Hara stated previously on a blog she submitted, the National Leadership Conference for State Officers in Springfield, Illinois was two weeks ago. It was a blast! We attended the conference with state officers from Illinois, Wisconsin, and Missouri! We all had a great time and we cannot wait to see our friends that we met at NLCSO throughout the year! Here lately around the state officer house, we have been very busy! Last week was Summer Challenge! I am pretty sure I can speak for everyone when I say that we all had a blast! Whether we were swimming in the lake and sliding down the slide, or maybe we were shooting some hoops on the basketball court or even serving it up on the volleyball court, there was never a dull moment during camp. Members had the opportunity to utilize the new ropes course that were just installed not too long ago as well! 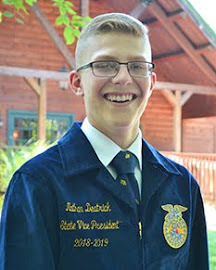 The National Western Region Vice President, all the way from the state of Oregon, Mr. Jason Wetzler joined us during camp and he shared some of his memorable childhood experiences and some lessons that his grandma taught him growing up. Thank you to Mr. Wetzler for joining us last week! I would also like to send a huge shout out to Dow AgroSciences for sponsoring Summer Challenge and also to Tobacco Free Johnson County for also sponsoring the camp and canoe trip that the campers thoroughly enjoyed on Wednesday. 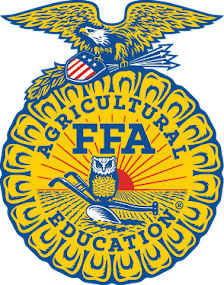 Sponsors, thank you for making Summer Challenge possible for the members of Indiana FFA. On July 13, the state officer team went to the Johnson County Fair to serve ice cream at the Farm Bureau booth! Also, our very own, former 2013-2014 Indiana FFA State President, Miss Allie Abney was crowned as the 2014 Miss Johnson County Queen! We are so proud of you Allie and I know that you will be a great representative for your county! Have fun with the rest of your week at your county fair and good luck at the State Fair Queen Pageant in January! This week has had a great start! Tuesday morning, the 2014-2015 Indiana FFA Executive Committee had the awesome opportunity to visit Elanco in Greenfield, Indiana. The Executive Committee is made up of District Presidents, Section Directors, Band and Chorus Presidents, and State Officers. While at Elanco, the committee members had the opportunity to tour Elanco's facilities and learn about the background of the company. While at Elanco, we all also had Insights training which was a cool program that helped distinguish what style of leadership everyone uses. We all learned that whether we are calm, cool, and collected or even if we are loud and like to take charge of most situations, we are all leaders and we all possess similar leadership traits! Thank you to the staff at Elanco for helping us out on Tuesday and to those who facilitated training! We appreciate your support to our association! Executive Committee training was rapped up yesterday at the Leadership Center with a session lead by Mr. Martin, the Indiana FFA Program Specialist. The committee set goals that they hope to strive for as individuals, as a team, and goals that they hope the state of Indiana will achieve by the end of the year. I cannot wait to get to work with the members of the Executive Committee throughout this year! 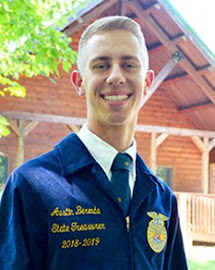 Tomorrow the state officer team will travel to the Indiana State Department of Agriculture to meet with the Director, Mr. Ted McKinney. We are excited to share some of the goals that we have set as a team and some of the goals that the Executive Committee has also set for our state association. This weekend is our first official weekend home! It will be nice to spend some time with our families! On Monday, State Secretary, Mr. Skylar Clingan and myself will be headed to Washington D.C. for the State President's Conference! We will have the opportunity to meet other state officers from around the U.S. and we will also be voting on proposals that have been made by other states. I personally cannot wait to be a voice for the state of Indiana and to meet other state officers from across our great country! I still cannot believe that we have officially been in office for four weeks! I feel like we were just voted into office a few days ago! As a team we are so incredibly pumped to see what ways God will use us this year! I cannot wait to meet all of you! Like I said earlier, every day really is a gift so we might as well make the best of it! I know that I will enjoy every single day that I am blessed with this year as I serve our state! I am going to leave you all with a quote. I actually posted this on my Instagram just yesterday. "Once we make the decision to give of ourselves, God will provide the opportunity." 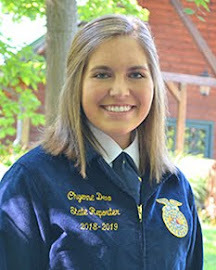 I am ready to make every day count and I am pumped up and ready to give of myself and serve Indiana FFA! Make today a great day!